Not so much time for the garden this week as I have been busy at other things, but thought I’d update you from the nursery (a.k.a. the greenhouse). I have a single disappointment. The tomatoes. I am not sure what I am doing wrong with them, but many have upped toes and died, others seem to be fine (if not actually growing). I suspect they don’t like the greenhouse, which can get very warm despite all vents opened (I have now shaded the front half of the greenhouse with shadecloth) so for now they have gone back to their heatpads atop the veranda where they can sit in dappled sunlight for a few hours a day. I stand before them and beat my breast and say, “What have I done?” but they refuse to answer. In the meantime I have resorted to a sometimes used tactic and headed off to the local plant nursery which sells heirloom tomato seedlings and bought several well grown ones. LOL Let’s see if I can kill these. Otherwise things are powering along. The musclemen of the veggie garden, the pumpkins, just seem to ROAR out of their seedling beds. I sow 2 seeds per pot and then remove the weakling (if one exists), and even the weaklings have within 2 days of emerging powerful root systems that spread all over the palm of my hand. The capsicums are doing well, the cucumbers as well. Most other things have emerged and are growing along nicely. The potatoes onions, shallots and garlic are doing very well. I might dash out and take a few photos – back in a tic! Click on the images for larger ones. These are the adopted tomatoes! They’re sitting in an old high-sided cat litter tray which protects them from the wind but gives them lots of light and air. At night they go into the greenhouse but during the day they are outside in a protected spot. 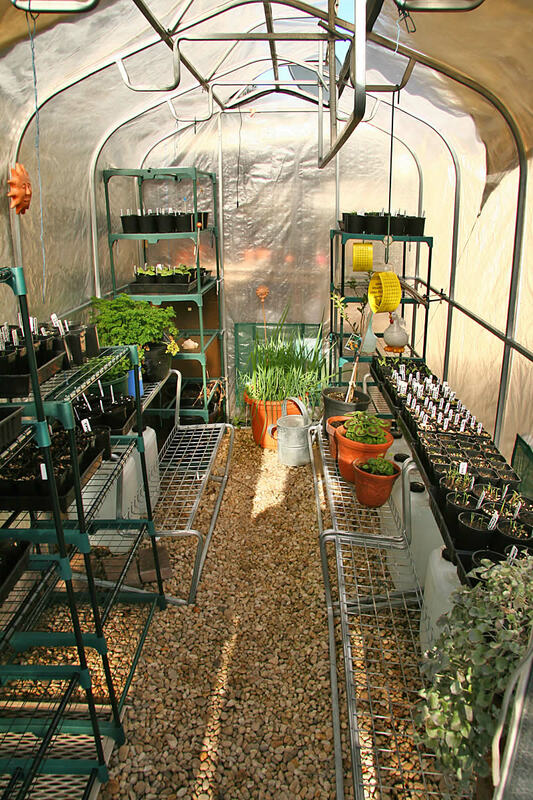 Inside the ever-expanding greenhouse. The yellow things hanging down are sticky insect traps for things like white fly and aphids etc which can get into the greenhouse – already they’ve stickied a quite a few insects. 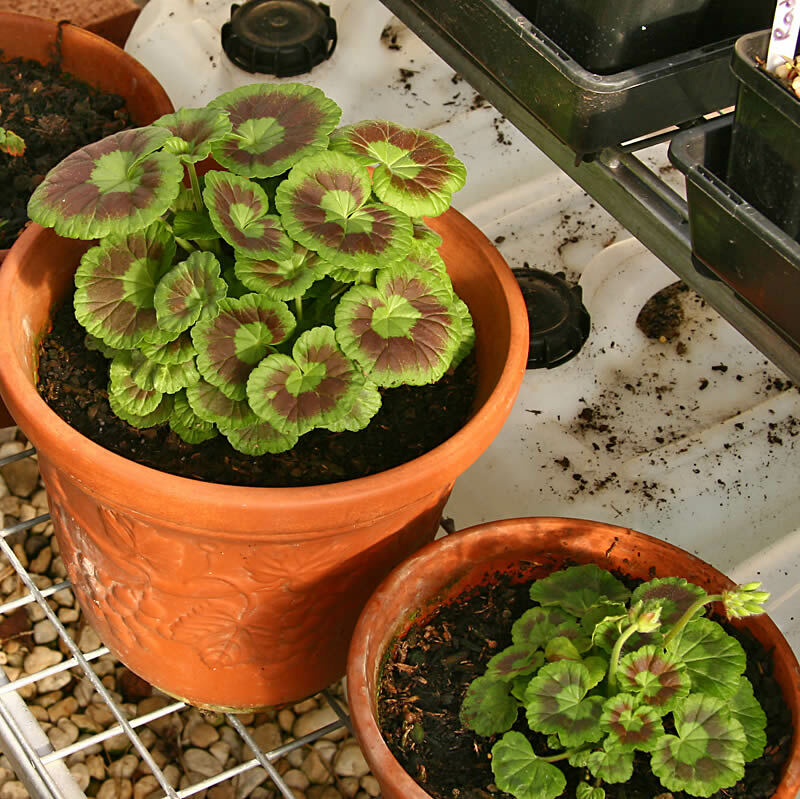 Some small scarlet geraniums I am growing on for colour. The warthog pumpkins powering along. Some herbs, from left to right, basil waiting to germinate, spearmint (I love this for a tea; ignore the price on the pot, this pot has been recycled many times!) and some winter parsley that has been going since early this year. 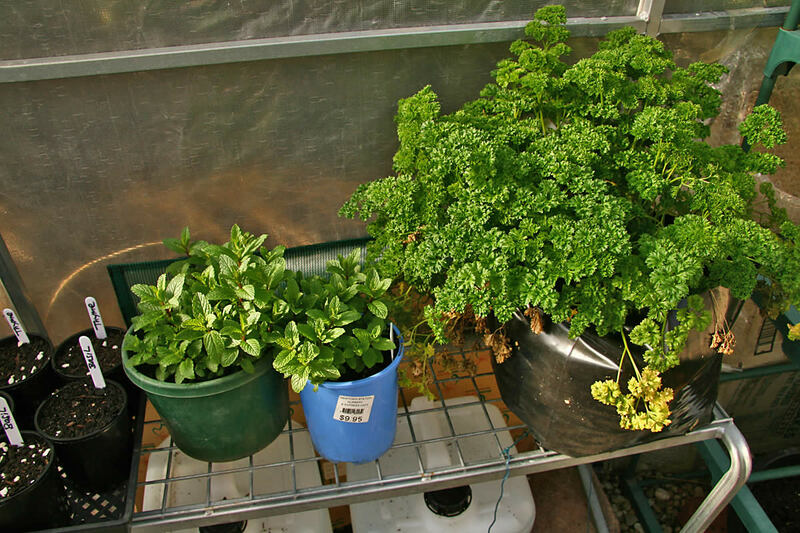 The parsley is growing in a hydrophonic grow bag which I use often. One of the beds of King Edward potatoes, all looking happy. And now for some flowers. 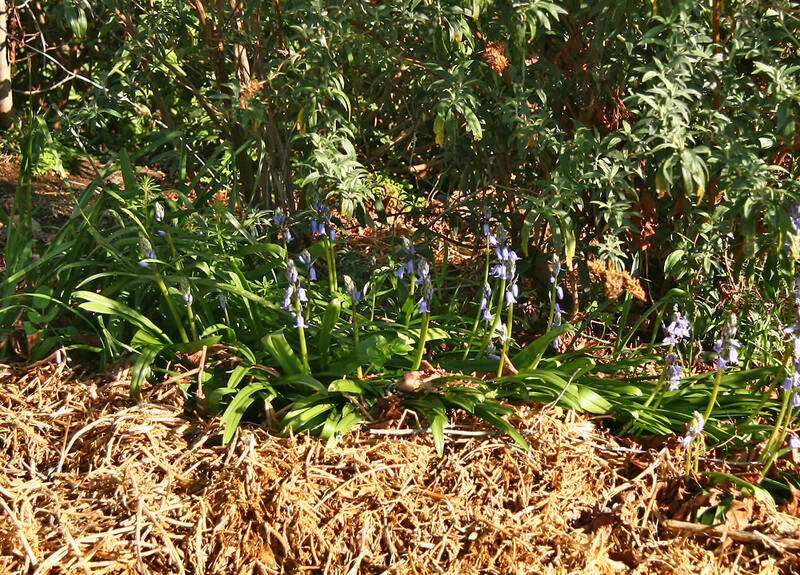 Some Spanish bluebells under some shrubs (butterfly bushes). These are indestructible – I’ve had bulldozers run over these and they’ve kept on keeping on and spreading further each year. These were already in the garden when I arrived. And, last, a view of one of the cats’ enclosures. From left to right you can see a climbing blackboy rose, a huge rosemary bush, some lemon balm at its feet, a daisy, behind the daisy some jasmine crawling over the potting sheds, a bare-branched apple and right in the front to the extreme right, the tiny peach I thought had died but which is now bursting out in finery. The greenery in the mulch are peas starting to grow on. Next post The Copper Preserving Pan - Finally. Previous post Environmentalism V. Self-Justification?? 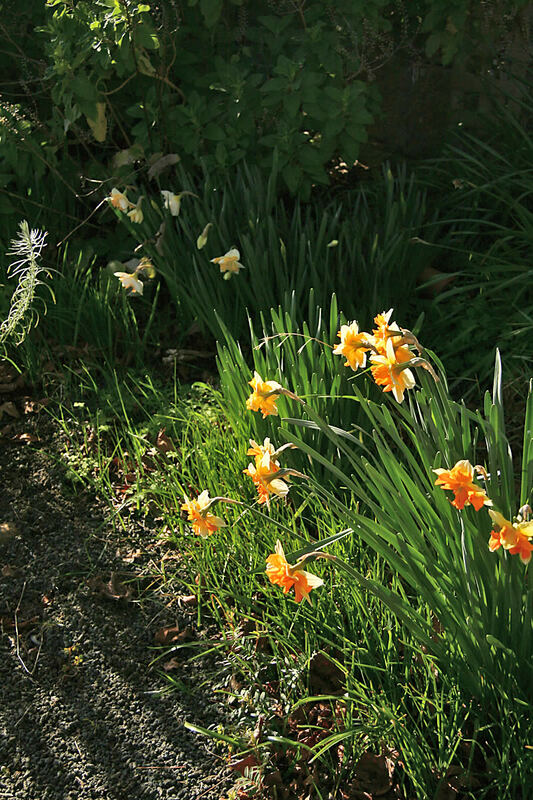 Your Spring garden is looking great, Sara. The rosemary looks very happy to tell by the lush green of the leaves and the pretty flowers. 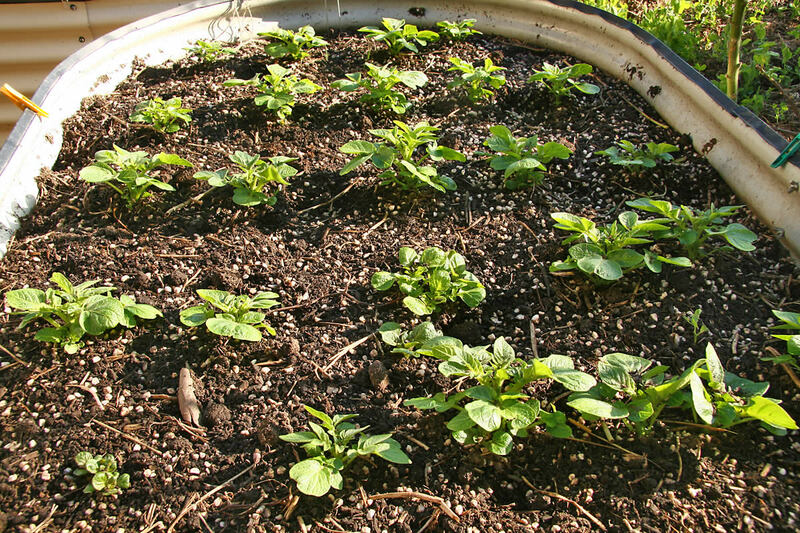 Rightio..spuds in the birdies…so how long have yours been in?? I may rush to Bunnings and see if they still have seed spuds..tho on second thoughts ..getting them out might be the problem ..
You always inspire me …I MUST plant up the second birdie. Birdie one is doing great ..I’m picking snow peas ..just put in my second crop of bok choy, and picking cucumbers..the lebanese ones, have tomatoes and corn ripping along..the capsicums are a little behind as is the ceylon spinach. Maybe humidity is the problem. I don’t know. Silly tomatoes. How organized you are! And how lovely everything in your nursery looks. Some great pictures there, Sara. 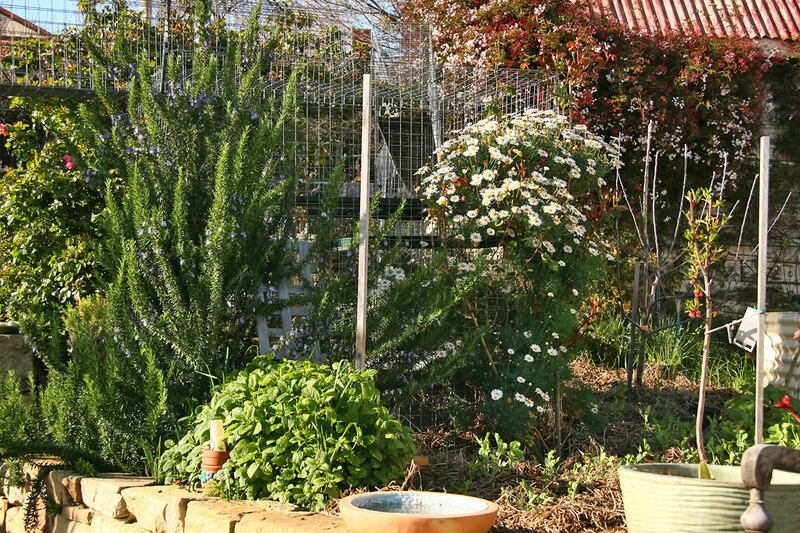 The rosemary is certainly looking healthy – is it not put off by the cold? Pumpkins are enthusiastic growers. If they’re starting out that strongly now, then they’ll be over running the place tomorrow. With the tomatoes, I’ve got no ideas. How did they die? Did they just wilt and rot, or did they go leaf by drying brown leaf? 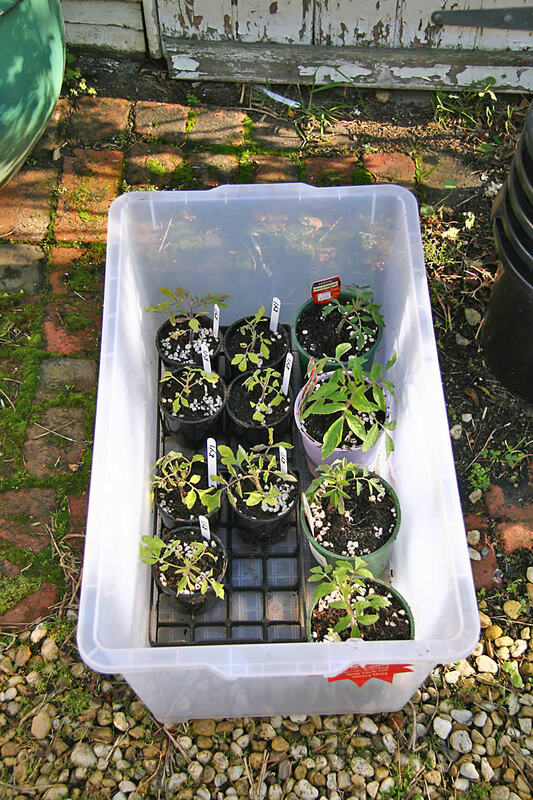 Sara, I think that the tomatoes might benefit from a less enclosed environment while they are outside during the day. More space/air between plants should promote faster growth and stronger plants. An update on my fruit crops. You might remember my small fig tree that I planted two seasons ago. Well, I harvested two figs this Summer! My apple tree produced only about two dozens of apples that did not really prosper and were not edible. I’ve pruned the watershoots on the apple tree a few days ago, and will do some more corrective pruning next February. I hope to have a good apple crop next year. How are your apple trees doing? 1. Make sure seedlings have very strong roots; don’t worry so much about full, green foliage. A runt with good roots will outgrow a big plant with weak toes. 2. 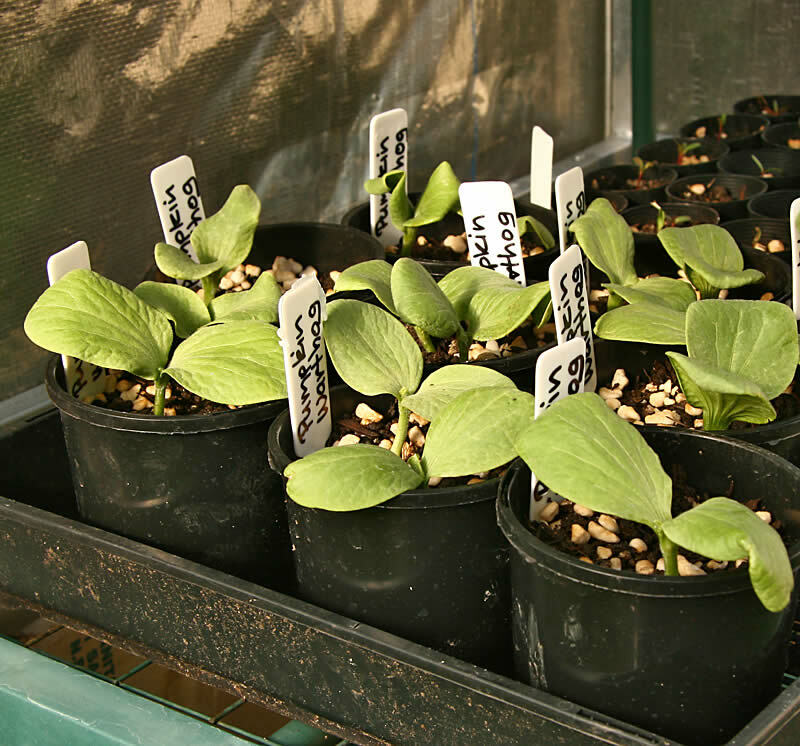 Pinch off the bottom set of leaves from seedlings, then plant them right up to the new set of bottom leaves, burying the stem. 3. Give enough room for air circulation. I usually allow at least the distance from my elbow to fingertips in each direction when planting in the ground. When using pots, use large ones. Tomato roots grow deep and wide. 5. Give the beds a solid 10 hours per day of direct summer sunlight. The stronger the sun, the better! 6. Thoroughly soak the beds once a week, or every 5 days during summer’s extreme. They may seem to want it more often, but you want to encourage the roots to grow deep as well as wide. Make sure you have good drainage if growing in pots. 7. Put stakes in the ground next to the plants when you are first planting them. This will prevent damage to the delicate root system later on.